← 387 "Kill Gil, Volumes I & II"
The Simpsons are pinned onto a board. The Wife Aquatic is the tenth episode of the eighteenth season. It originally aired on January 7, 2007; this episode was nominated for Television Episodic Comedy in the 15th Environmental Media Awards. "Marge reminisces of the time in her childhood she travelled to a special place called Barnacle Bay, but when she is taken there by Homer, they find the island is very poor, but despite this, they stay on the island, however all turns sour when Homer goes fishing and is trapped in the middle of the storm, with no raft - but Bart instead." The Simpson family goes to see an outdoor movie, but when they get there, the entire area is crammed with people, except for one spot. They race Milhouse and his family to the space, and Homer succeeds by wrapping a picnic blanket around Maggie and throwing her into the space, where she uses the blanket and parachutes down to fill the space. When the silent film Ned Flanders brings fails to please the audience, Patty and Selma produce one of their many old-fashioned film reels and plays a movie of Marge's childhood paradise, an island called Barnacle Bay. Homer ends up taking the family to the island, where they find it is a disgusting slum full of bums and drug users. The night they stay, Homer gets a group of out-of-business entrepreneurs to rebuild the carousel Marge used to ride on, and invites Marge to ride on it with him. While Bart and Lisa power the carousel from underneath, Homer sets off a fireworks show, attracting a large number of people, then accidentally sets the dock on fire, burning it and the carousel completely down. The residents of the island hang him from his nose on a fish hook until Marge comes and releases him. They find out the island's economy failed when overfishing drove away the prized Yum-Yum Fish, and Homer promises to bring the fish back to the island to repay the damages. While Homer is on a boat fishing, Marge and Lisa visit a storm watching center and find out that a massive storm is heading right for where Homer is. On the ship, Homer mixes up his directions and "puts bait on the steak and beer-batters the fish hooks", but the batter brings back the Yum-Yum Fish. Homer briefly finds joy in clubbing the hundreds of fish they catch to death when the storm strikes. When they open the compartment for the life raft, there is no raft, only Bart. The ship has to stay afloat on large waves, and finally, they encounter a huge wave they barely are able to climb over. Behind it, there is a mountainous wave ten times higher that all but destroys their ship. When the storm goes, they are rescued by the Japanese fishing ship Iruka-koroshi-maru (いるかころし丸 Dolphin Killer), but are thought dead by all on the island. 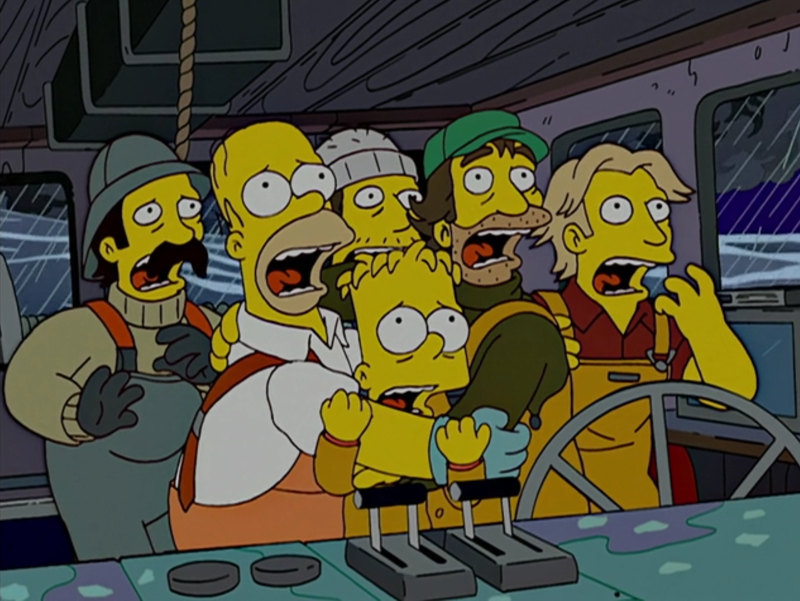 As a memorial service occurs back on the island, Homer, Bart and the ship's crew burst in and everyone goes out to catch Yum-Yum Fish with Homer's new recipe. However, Lisa bars the way and warns the islanders that overfishing the fish will only bring the island its former woes again. Of course for a fishing island to give up its fish it has to do something just as profitable instead, and much to Lisa's objection, the villagers abandon the fishing trade and begin large scale logging operations all over the island. Modified on July 2, 2018, at 12:00.